Calooka: a light, angular Art-Deco font from 1923, perfect for invitations. Includes many ornaments. WF Calooka is well-suited for Art-Deco inspired designs that call for a light, eclectic look. A selection of period ornaments complements the unconventional letterforms. The inspiration for WF Calooka came from a 1923 high school graduation invitation, which may have been hand-lettered. I completed the character set, and altered some of the existing forms to improve the overall appearance, as shown in the full specimen to the left. 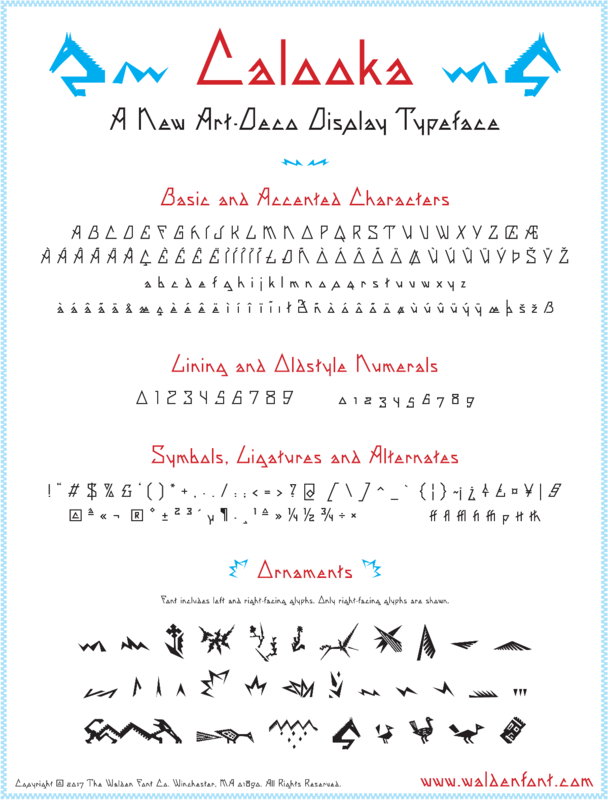 The typeface comes in TrueType-flavored OpenType format, suitable for all major operating systems. Please inquire about other formats.